Luck, like our furry four-legged canine companions, can often be a man’s (or a lady’s) best friend. 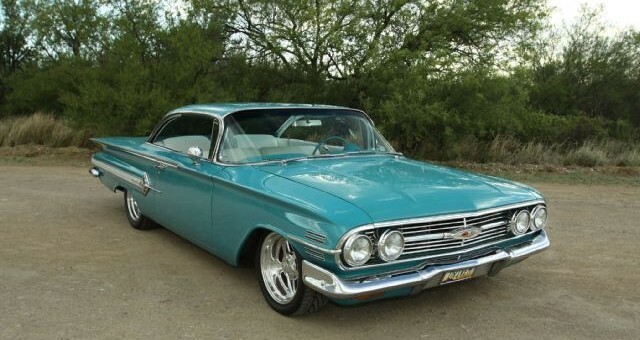 Such as it was with Ron Troutman’s 1960 Chevrolet Impala. About 11 years ago, Troutman was cruising through Meza, Arizona when he happened to spot the sculpted haunches of a ’60 Impala. Its paintjob and trim pieces were in bad shape but he knew he’d have to bring it home once he popped the hood and spotted the freshly-rebuilt 348ci. He scrapped the standard cast-iron Powerglide slushbox and fitted a 700-R4 box in its place, while a 10-bolt rear end with 3.08 gears and a custom-made driveshaft were also incorporated into the mix. Ron then removed the motor altogether, tweaking it here and there with a 0.010-inch overbore and a hotter Crane cam. Also fitted were an Edelbrock carburetor, modernized ignition, a cross-flow aluminum radiator, plus A/C from Vintage Air. Ron also eventually modified the ’60 even further and, unlike many classic car owners, has dealt with very few problems over the years. As for that crusty old Tresco Turquoise paintjob, the car was soon stripped down to the metal and on went a fresh mix of DuPont base and PPG clear. It’s not the factory shade but we’re convinced only the most esoteric Impala fan could tell the difference; and it’s simply stunning. Ron’s story might not be the most romantic guy-sees-car-buys-one-years-later story but, as he soon learned, luck can sometimes guide you right where you need to be. We love the fact Ron isn’t scared to point the Impala’s quadruple headlamps down long roads — he’s stacked up more than 70,000 miles in the past ten years. More pics can be found at Super Chevy.